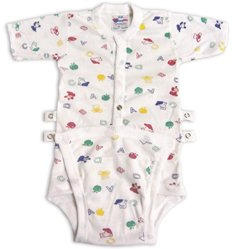 This is a terrific one-piece pair of baby underwear at a mercifully great price. You're going to need lots of these! Easy care - machine wash warm; tumble dry medium. If necessary, use a non-chlorine bleach. Size (inches): 8.66" X 5.31" X 1.18"
Please Note: This item is available in various patterns. Unfortunately, the pattern you receive may be different from that which is shown.